In 1545, a native Andean prospector hit pay dirt on a desolate red mountain in highland Bolivia. There followed the world's greatest silver bonanza, making the Cerro Rico or "Rich Hill" and the Imperial Villa of Potosí instant legends, famous from Istanbul to Beijing. The Cerro Rico alone provided over half of the world's silver for a century, and even in decline, it remained the single richest source on earth. Potosí is the first interpretive history of the fabled mining city’s rise and fall. 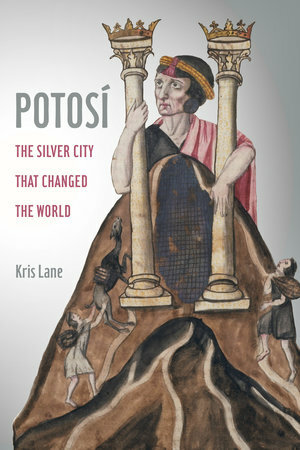 It tells the story of global economic transformation and the environmental and social impact of rampant colonial exploitation from Potosí’s startling emergence in the 16th century to its collapse in the 19th. Throughout, Kris Lane’s invigorating narrative offers rare details of this thriving city and its promise of prosperity. A new world of native workers, market women, African slaves, and other ordinary residents who lived alongside the elite merchants, refinery owners, wealthy widows, and crown officials, emerge in lively, riveting stories from the original sources. An engrossing depiction of excess and devastation, Potosí reveals the relentless human tradition in boom times and bust. Kris Lane holds the France V. Scholes Chair in Colonial Latin American History at Tulane University. He is author of Colour of Paradise: The Emerald in the Age of Gunpowder Empires, Quito 1599: City and Colony in Transition, and Pillaging the Empire: Global Piracy on the High Seas, 1500-1750.